What are the real objectives of these banners anyway? Some races have them and some races don’t. Boston, for example, has neither a start nor a finish banner! The sizes and dimensions are all different. Some have wind holes in them, some don’t. What they are affixed to is very different from race to race – scaffolding, truss, poles, trees, scissor lifts, buildings. What they are made of is also very different – cloth, nylon, Tyvek, etc. How high or low that are hung is always different and whether or not a clock is suspended below the banner. Simply to identify exactly where the start and/or finish of the race is. To promote the race sponsors and/or charities. To identify the name of the race. It seems most emphasize the words START and FINISH on the banners. See these New Balance Falmouth Road Race banners. Others just put the name of the race and sponsors on the banners and not start or finish. 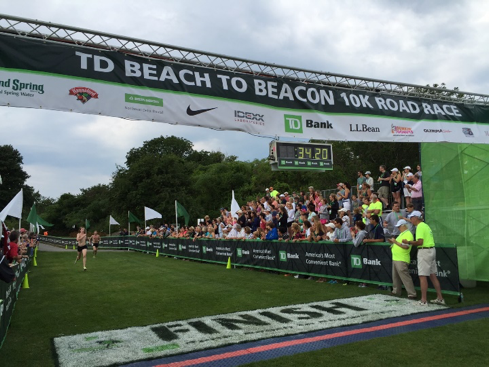 See these TD Beach to Beacon banners – however, see the words START and FINISH painted on the road / ground. And, many don’t even put the name of the race on the banner which I find a little odd. For some reason, the words START and FINISH seem more important to them. How much is printed on the banner is intriguing. Some try to jam a lot on the banner making the print size so small that from a distance you can’t read anything which kind of defeats the purpose! Title sponsors usually expect their name/logo to be printed on these banners but so often it is in really small font. Depending on what your sponsor contracts commit to, in many cases, numerous sponsor logos are required to be on the overhead banner. One way around this is to include other side vertical banners with sponsor logos on them. Now add to all this a finish line break tape (what should that say?) and a painted start or finish line on the road (how should they be oriented?) and all of this can drive you to drink! With a common start and finish, what should the banners then say? And, I suppose it depends which way the runners are heading out and then which direction they are returning. If they are heading out and returning in the same direction, does that make it any simpler to decide? Not really. What is the orientation of the banner? Should the word START be facing the runners or should it be facing the photographers standing in front of the banner? Same with the word FINISH? If you put START on one side and FINISH on the other, which way are they facing? There is no perfect solution to this one! Maybe neither start or finish should be on this common banner? Determine your objectives early on with these banners and thus what is going to be printed on them. Asks for proofs first from you banner vendor – be sure everything is sized properly and the spelling is all correct! Pretty embarrassing when you hang a banner for the world to see and you spelled a word wrong – it has happened to me more than once! Be sure you deliver what is promised to your sponsors – who is on the banner and who is not. Have a plan in advance on the material, single or double-sided, wind holes, sizing and what you will be affixing them (safely) to. Orientation – you have to decide what should be facing the runners and what should be facing the photographers and spectators. Everyone has a different opinion on this…but there is no real right or wrong…just a preference. Hanging the clock – if you are hanging a clock below the banner from a truss, have a plan for where the exposed chains will be. If not done properly this alone could ruin your banner shot. American flag – one last unique tip – if you are affixing an American flag up by your start or finish banner, be sure it is always on “runner left” as they run. And, people think directing races is simple??!! We many times can’t even all agree on what our start and finish banners should look like, how to orientate them and how to hang them!